On January 9th, 1992, the face of our cosmos changed. What had been hoped for and dreamed of for centuries was finally confirmed. Using the 305-meter antenna at the Arecibo Observatory in Puerto Rico, Polish astronomer Aleksander Wolszczan and American astronomer Dale Frail announced the discovery of the first confirmed planets beyond our solar system. These two exoplanets orbited a very inhospitable star, the pulsar PSR B1257+12, and calculations showed they had at least 2.8 and 3.4 Earth masses. The pair revolved around the pulsar in almost circular orbits with a radius of 0.47 AU and 0.36 AU, and their orbital periods were just 98 and 67 days. 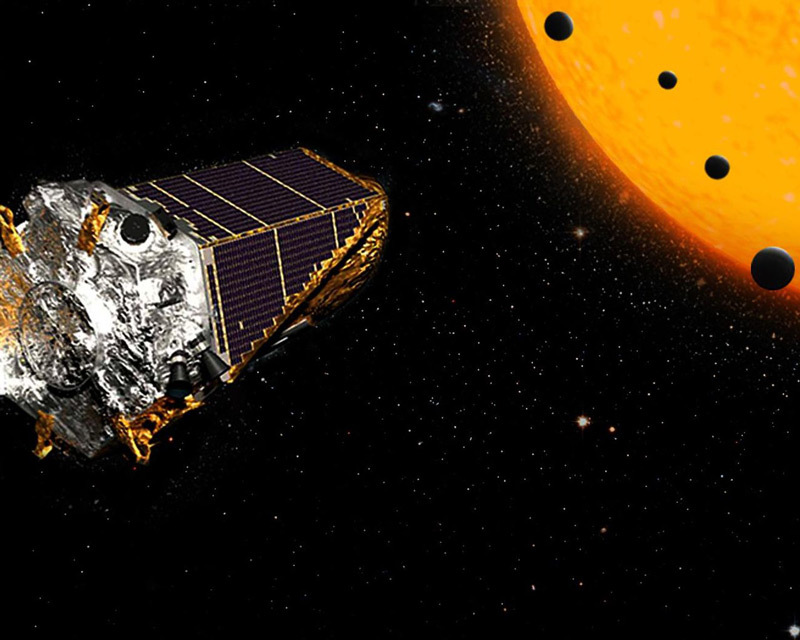 Seventeen years later, exoplanet discoveries abounded after the launch of the dedicated exoplanet-hunting Kepler Space Observatory in 2009. As of 2018, Kepler had confirmed over 2,600 exoplanets and cataloged an additional 2,700 suspected exoplanets awaiting data confirmation. Of all the confirmed exoplanets, only 30 are thought to be potentially habitable, having less than twice the size of the Earth and lying within the habitable zone of their host stars. This "habitable zone" is defined as the region in a planetary system where liquid water might pool on the surface of an orbiting planet. While these 30 exoplanets could potentially sustain water, more advanced telescopes and technologies are needed to determine the suitability of the atmospheres and geologies of these distant worlds for life. The fundamental process used by Kepler to determine candidate exoplanets around a star is conceptually simple. Light from the star is measured precisely for an extended period to determine if there is a dimming in the brightness that could be caused by the transiting of an orbiting exoplanet. This process requires that the exoplanet's orbit be oriented in such a way as result in a transit of the star as viewed from Earth. Once a detection of a transit is made, the data is used to calculate the planet's size based on how much the star's light was dimmed. An analysis of the property and distance of the star then yields the size of the planet's orbit and its mass. From the orbital data and the temperature of the star, astronomers can then determine if the planet lies in the habitable zone of its host star. While Kepler has discovered many exoplanets, its search was limited because it scanned only in a very small part of the sky looking outward along the Orion Spur of the Milky Way Galaxy in the direction of the constellation Cygnus, Lyra, and Draco. Although Kepler's search zone was so small, it still gathered an enormous amount of data: as of 2015 it gathered 12.5 billion brightness measurements on more than 300,000 stars! With so much data to analyze,the professional community has called on the public at large to assist in searching for signs of exoplanets. Kepler mission data can be analyzed by interested laypersons on several websites, including PlanetHunters.org, Zooniverse.org, ProjectPanoptes.org, and DiskDetective.org. For the non-professional astronomy community, however, is there any way outside of just data analysis to participate in the exciting realm of exoplanet measurement and discovery? While many amateur astronomers may think detecting transiting exoplanets around distant stars is only for professionals with state-of-the-art ground-based and space-based telescopes, the fact of the matter is that for amateur astronomers adept at imaging with their telescopes, detecting exoplanets is actually doable, even with small aperture telescopes! 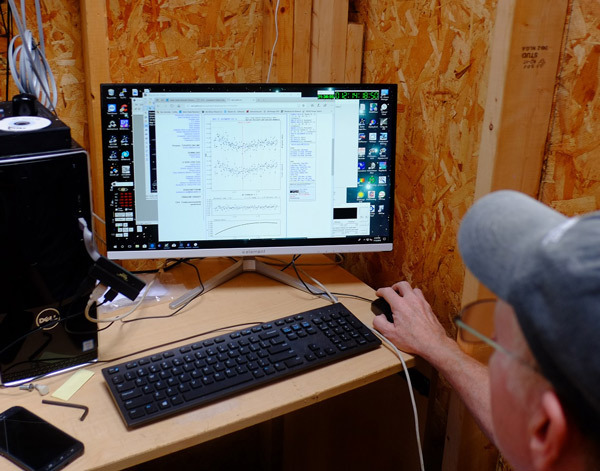 One group of amateur astronomers have established the capability to detect exoplanets at the Mark Slade Remote Observatory (MSRO) in Wilderness, Virginia (look for @remotetelescope on Facebook to find the MRSO's Facebook page). MSRO is now fully operational and open for use by local astronomers and members of the Rappahannock Astronomy Club. 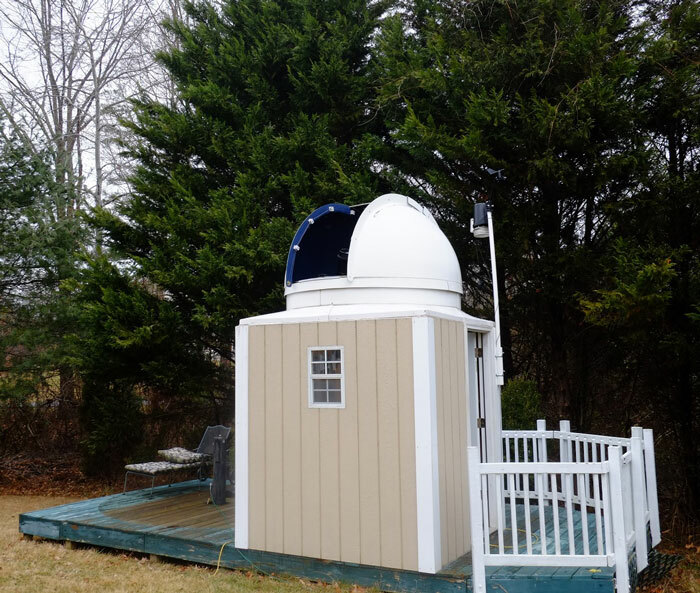 Equipment for the observatory was donated by the estate of Mark Slade, Explore Scientific, the Rappahannock Astronomy Club, and by private individuals in the Fredericksburg, VA, region. The local astronomers responsible for establishing the observatory formed the MSRO Commission to oversee the building out of the observatory's capabilities. These local astronomers include: Dr. Myron Wasiuta (Director MSRO; Optometrist), Jerry Hubbell (Assistant Director MSRO; Director Electrical Engineering, Explore Scientific, LLC), Dr. Bart Billard (Physicist), Linda Billard, Lauren Lennon (MSRO Staff Astronomer; Astrophysicist; Investment Analyst), and Scott Landsdale (President Rappahannock Astronomy Club). The MSRO Commission began the design and construction for the observatory in November 2015. Just a few months later, in February 2016, the observatory was commissioned and declared operational. While all the equipment was in place and operational, this by no means meant exoplanet detection could proceed. Instead, observatory users who wanted to do exoplanet transit imaging needed to take the time necessary to get their individual imaging skills honed for the process. Fig. 3. The Mark Slade Remote Observatory (MSRO) in Wilderness, Virginia. Credit: William Paolini © 2018. Perform aperture photometry procedure on each target and reference object in each frame (i.e., measure of star brightness subtracted from the brightness of the sky background around the star, then adjust that based on several reference stars in the frame). "The goal is understanding the impact of how each piece of equipment is used, how it operates, and how it either adds to or detracts from the quality of your raw data. To get the best exoplanet transit data one really needs to maximize the performance of the mount system in tracking the object so that it keeps the light from the objects measured on the same pixels of the CCD for hours on end. The main factor in getting the appropriate precision for exoplanet measurements is to maximize the signal-to-noise-ratio. A signal-to-noise-ratio of at least 1000 to 2000 is required to get the shot or Poisson Noise precision (a statistical noise present in all radiation measurements that is independent of environmental errors)down to the milli-mag (1/1000 magnitude) level. Once that is done, then it's time to deal with the scintillation precision and get that to the level you desire. Overall, the biggest challenge is to minimize the error in the measurement system while maximizing the signal to noise ratio. Key items for obtaining the best transit data include: consistently tracking the object, keeping the camera temperature stable to minimize the need for data corrections due to small temperature changes, and observing when the skies are cloud free and the seeing is as good as possible to minimize the need for de-trending the data for air mass changes." MSRO astronomers further explain that there are multiple levels of calibration one must perform when tuning any imaging system for exoplanet transits. There are of course the typical more "static" aspects of calibrating the system such as achieving precise pointing and tracking accuracy. There are also critical "dynamic" data corrections necessary with every observing session such as de-trending the data from the effects of air mass changes during each transit observation and correcting the data from each observing session for slight changes in the CCD temperature to name a few. Then flat frame calibration must be done prior to each session. Flat calibration is important because every pixel of the CCD has slightly different sensitivity, and there may be dust on the optics or on the CCD, vignetting effects, and other optical defects in the system. All this is done by normalizing the individual pixel response differences across a test frame. Less often, it's also necessary to acquire calibration frames for dark and bias correction. This accounts for the digital"noise" from the amplifier circuits and noise from thermal effects of the CCD as it operates. These effects do not typically change from day to day since they are intrinsic to the camera and are fairly constant at a given temperature. While all this sounds complicated, with practice it takes only about 15 minutes during twilight to gather these session-level calibrations and another 10 minutes or so slewing to and identifying the target before imaging begins. The imaging process typically runs for a few hours for an exoplanet transit conformation. During this time a meridian flip of the telescope may also be needed in which case imaging stops during the flip, then another 5-10 minutes is spent getting back on target to complete the transit imaging. Fig. 4. 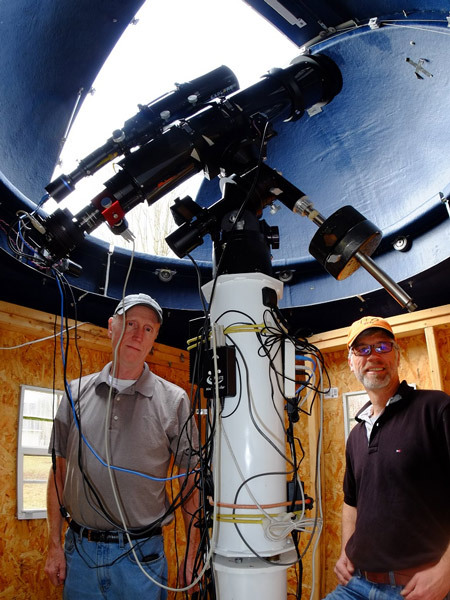 Jerry Hubbell (left) and Dr. Myron Wasiuta inside the Mark Slade Remote Observatory (MSRO). Credit: William Paolini © 2018. With this equipment, the observatory can detect minor planets and stars as dim as magnitude 18, and their astrometric measurements are possible with a typical error of 0.15 arc-seconds. Their first observation and detection using the MSRO was exoplanet HAT-P-30/WASP-51 b. They imaged the exoplanet transit on January 6, 2018 and submitted their data to the Exoplanet Transit Database (ETD) the following week. Their data is now available to all exoplanet researchers, both professional and amateur. Their final light curve data is shown in Figure 5. Fig. 5. 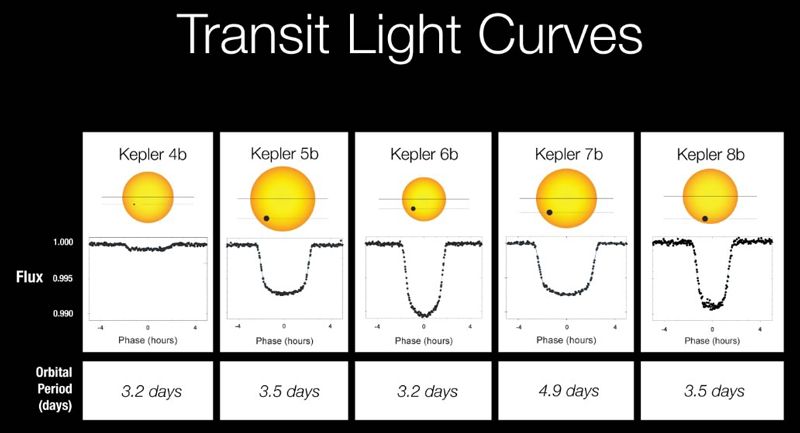 MSRO transit curve data on exoplanet HAT-P-30/WASP-51 b. Credit: Barton Billard and Jerry Hubbell. Fig. 6. Jerry Hubbell in the MSRO reviewing transit curve data they detected and published on exoplanet HAT-P-30/WASP-51 b. Credit: William Paolini 2018. Future plans by the group at MSRO include a collaboration with Denis Conti, Exoplanet Coordinator for the American Association of Variable Star Observers' (AAVSO). They are working on new instruments and techniques to obtain higher resolution photometry with smaller instruments. This important work will enable amateurs to provide critical follow-up observations for the professional observations from the new Transiting Exoplanet Survey Satellite (TESS) which launched April 18, 2018. TESS's two-year all-sky survey will focus on nearby G, K, and M-type stars, including the 1,000 closest red dwarfs in an area 400 times larger than that covered by the Kepler mission. TESS will also provide prime targets for more detailed investigation with the James Webb Space Telescope (JWST) and other large ground-based and space-based telescopes. TESS's system has a 20 arcsec/pixel resolution whereas ground instruments like MSRO have a 1.4 arcsec/pixel resolution. Follow-up readings for TESS from ground-based instrumentation like MSRO are therefore vital to increase confidence that any light curve changes in TESS's data are not due to background stars in its resolution field. Exoplanet research has therefore opened a new area where professional-amateur collaboration is not only desired, but which can be critically supportive. For anyone interested in tuning their existing imaging system for exoplanet transit research, or building a system from scratch, there are several good resources available. Bruce L. Gary produced a wonderfully detailed 162-page PDF resource called "Exoplanet Observing for Amateurs". It is free for download at http://brucegary.net/book_EOA/EOA.pdf. As Bruce explains, exoplanet transits have been observed even with small 4" telescopes. However, he recommends a minimum beginner setup with a 10" or 11" SCT with equatorial mounting, a monochrome 16-bit CCD camera with color filters, and Maxim DL astronomical imaging software suite. For as little as around $5,000 and the dedication to honing one's skills at precision imaging, the amateur astronomer can contribute to the exciting realm of exoplanet research. A second excellent resource to the community is the internet portal of Czech Variable Star advanced amateur and professional astronomers founded in 1924 at this link: http://var2.astro.cz/EN/. (Note - each page of the site conveniently has a British flag to have it displayed in English). Their Project TRESCA (TRansiting ExoplanetS and CAndidates) section is devoted to exoplanet transits and they maintain the transit data for more than 300 known transiting exoplanets. 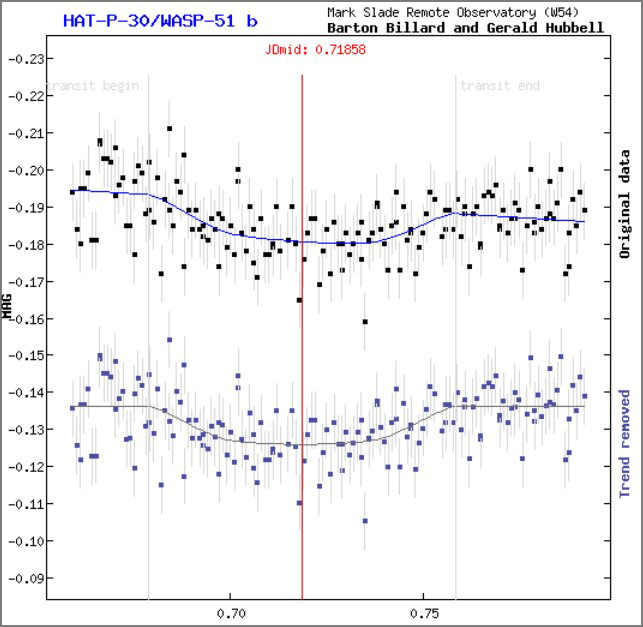 The first exoplanet transit light curve at MSRO by Barton Billard and Jerry Hubbell can be found here as well: http://var2.astro.cz/tresca/transit-detail.php?id=1515202863. Knowing that you have a verified system that can be put to effective operational use in doing both science and in training amateur astronomers. As an individual, being able to "see" for yourself there is scientific evidence of planets orbiting other stars and being able to continue to make and contribute scientific measurements without needing sponsorship or as some part of a "job". "I want everyone to understand that this work can and is being done by dedicated amateur astronomers across the globe and that you can do it also if you task yourself with obtaining the skills and knowledge about the equipment available and needed to do this work. You can do real, valuable science that even the professional astronomers do not have the opportunity to do on a day-to-day basis. I would not call ourselves amateurs even though we pursue this love of ours, we are all astronomers, so that is what you should refer to yourself as... an astronomer." For those readers interested in learning more about how to get started in exoplanet transit imaging and research, please don't hesitate to contact Jerry Hubbell at jrh@explorescientific.com. To discover more about the Mark Slade Remote Observatory, search @remotetelescope on Facebook to find the MRSO's Facebook page. This article is placed into the Public Domain by William Paolini 2018. Images © William Paolini 2018. For permission to use images, contact the author at wapaolini@hotmail.com.